If you caught it last year you’ll need little encourage to catch it again. Steve’s Fright Night Magic Show at Sheffield’s City Hall is a fitting climax to Britain’s biggest Halloween Carnival. You’ll experience a great evening of wonder, laughter and amazement with the finest and funniest from the world of magic. This year Steve is sharing the stage with Noel Britten and Rob James. Noel Britten’s award winning act has earned him a solid reputation for comedy excellence on the global circuit, so don’t miss out on this rare opportunity to see him here in Sheffield. Rob James will be presenting one of the strongest magic acts you will ever see. Rob is a master of sleight of hand, presenting inexplicable illusions with humour and flair. From the House of Commons in London to the Magic Castle in Hollywood, Rob James is a veteran of over 2000 performances. Rob performed in Steve’s show two years ago and people are still talking about it! Your host for the evening, award winning magician Steve Faulkner has spent the last twenty years performing his unique brand of comedy magic internationally. According to the promo for the show: “With a focus on highly skilled magic and humour, Steve’s unpretentious and relaxed style will leave you amazed, entertained and wanting to take him home for a cuddle.” Not sure about the last bit, speaking personally, but I can certainly confirm that Steve is one of the most entertaing and engaging performers around. His audience skills are a lesson for any performer. Steve managed to blow my mind and made me re-assess my knowledge of magic.” Matt Helders, Arctic Monkeys. 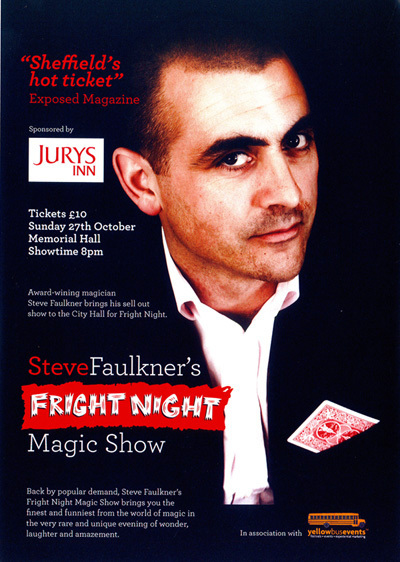 Tickets for Steve’s Fright Night Show, priced at £10, are available online at www.sheffieldcityhall.co.uk in person at the City Hall Box Office or by calling 0114 278 9789. The show is at 20:00 on Sunday 27 October, 2013, in the Memorial Hall. Yay thanks Russell! It will be much fun and we now have an even busier night with a third act. The wonderful and very funny juggler Matt Barnard. Also this will be the last show in a rather long time so it’s extra special. It’s worth noting that Noel has pretty much retired from performing so I feel very lucky to have him headlining the show. What a corker!